Bayou City Outdoors in the News! When you think art galleries, does an image of fancy-pants folk, sipping wine and using words like "post-modernism" come to mind? If you have shied away from the gallery scene because it felt a little too stuffy for you, then perhaps this Thursday's Arts and Crafts Crawl, hosted by Bayou City Outdoors, will be more of your cup of tea. Or beer. Beginning at 6 p.m., Thursday, January 30, Bayou City Outdoors is hosting its first arts and craft beer gallery crawl along Gallery Row on Colquitt. The concept may seem uncustomary -- fine art goes with wine -- but given the nature of Bayou City Outdoors and the continuous rise of craft beer interest in Houston, the partnership makes sense. Bayou City Outdoors is a member-based outdoor activity group for singles and couples who want to get outside with like-minded people. It's known for its emphasis on local doings, some of its events include hiking Brazos Bend State Park or walking the Rice loop after dark. Every month, they hold a "meet and greet" open to all, which usually takes place at a bar or restaurant in town. But for the month of January, they wanted to do something different...See the full article here. Also: it’s camping season. Unlike other parts of the country, where camping is most often associated with summer, here in Houston, weather conditions during these months are ideal for camping. We’ll learn about some of the more popular camping destinations and related activities in and around Houston as Bayou City Outdoors joins us for the day. Fox News Features Bayou City Outdoors in Fitness Segment! Fox News Features Bayou City Outdoors' Kayak Polo! Fox News Features Bayou City Outdoors Stand Up Paddling! Bayou City Outdoors was on Great Day Houston! Check it out! Houston Chronicle's Patrick Fallon did a piece on Bayou City Outdoors' Kayak Polo! Check Out the Article on Kelly in "She's So Skirt!" From Health & Fitness Sports Magazine's Trainers Table are the stories of Fit Houston Moms and Daughters and the bonds that they share through exercise and sports. Kelly and her mom, Joan, were happy to tell their story in the article, "In Their Own Words". “My mom (Joan, 78) is incredible,” Kelly Howard, 48, says. “When I was growing up, she was the only mom who exercised, and I thought it was pretty cool! For as long as I can remember, my mom practiced yoga and calisthenics. At age 50, and ready for a new challenge, she took up taekwondo. She is now a practicing 4th degree black belt and yoga instructor. 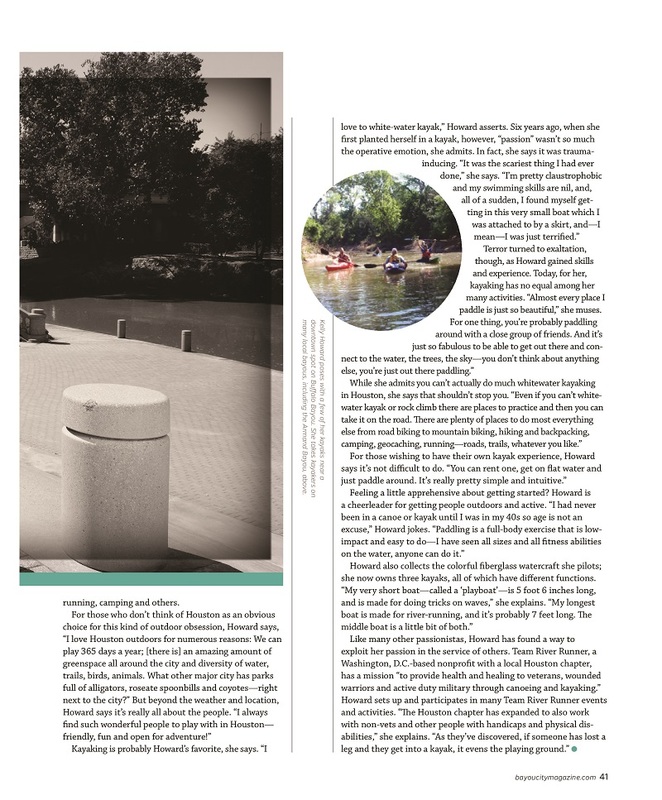 In the March 2008 Issue 111 Volume 10 of 002 Magazine, Bayou City Outdoors' Farmer's Market Tour was featured as one of their "4 Greats". To read more from this article, click here.